In 2015 the first Recognizing Outstanding Achievement in Resumes awards were given by the National Resume Writers’ Association. I received the top honor with this example. BACKGROUND: Steve had a long career in database marketing. He had recently earned some certifications in change management and was looking to switch careers to do more of that. Since he had not had an official job in change management we chose to highlight his experience related to change management in the summary, and created snapshots to feature his change management accomplishments for each position. The two resumes below were selected to be published in the upcoming book, Modernize Your Resume: Learn What It Takes to Win in Today’s Job Search by Wendy Enelow and Louis Kursmark. 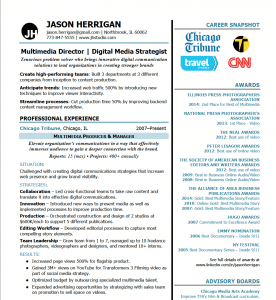 BACKGROUND: In Jason Herrigan’s resume it showcases his visual communications skills with the layout and links to his portfolio in tandem with his leadership abilities. Since he was targeting a creative position, it was important to demonstrate some of that with his resume. 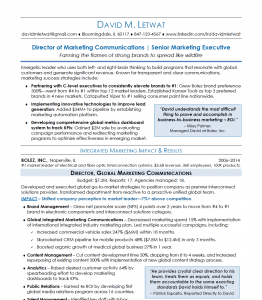 David Letwat’s resume succeeds in today’s job search because of how the candidate’s brand is infused into the document, especially with the subhead at the top, as well as the presentation of keywords. Just a few years ago, it was pretty standard to have a list of keywords in a core competencies section. Now, with this resume keywords are woven into the experience section and supported by accomplishments.